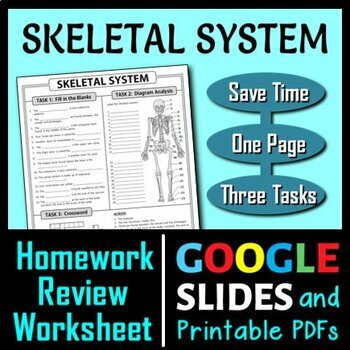 This Skeletal System Homework Review Worksheet is an EDITABLE one page sheet that provides three different tasks to help students review the structures and functions of the skeletal system. Assign one, two or all three tasks for various uses like homework, classwork, exit tickets, sub plans, in school suspensions or bonus work. ✿ Please click on the PREVIEW and zoom in for a closer look at the worksheet. Task 1: 15 Fill the blank questions. 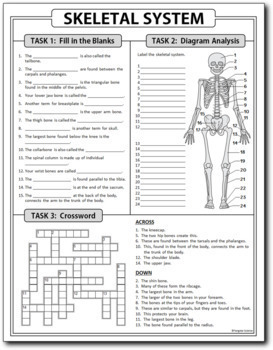 Task 2: 24 Parts to label on a diagram of the skeletal system. 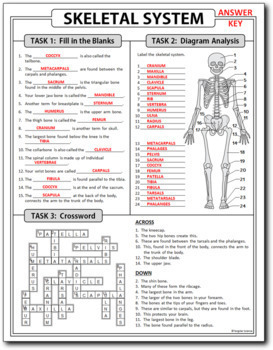 Task 3: 15 Terms to complete a crossword. An Editable PowerPoint Document is provided so that you can customize questions for your students. A full answer key is also given. I've packed a lot onto one page to save on photocopying and to simplify materials management. I hand drew the skeletal system diagram used in this worksheet in Adobe Illustrator so that the diagram is accurate and clear.